For 23 years Scott Gurney has played an integral role in the continued development and success of the Legion Athletic Camp. At the early age of 19 he committed five summers to the sport of basketball before switching for the last 19 summers to his first love of track and field. An all-around athlete at Winnipeg’s Silver Heights Collegiate, Gurney competed at the provincial level. His interest in coaching started at an early stage for while attending the University of Manitoba he found time in-between studies to volunteer for junior and senior high school athletics. He currently teaches and coaches at Selkirk’s Lord Selkirk Regional Comprehensive Secondary School. He previously had a seven-year stint at Lockport School. Several city and provincial high school track and field champions have benefitted from his knowledge. Gurney was combined events coach for Team Manitoba at the 1995 Western Canada Summer Games and distance coach for the 1997 and 2001 Canada Summer Games. In 2003 he was head coach for Team Manitoba at the Canada Summer Games. 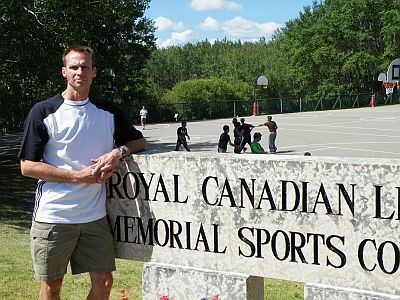 A past board member of Athletics Manitoba, Scott Gurney was nominated for the Manitoba High Schools Athletic Association Coach of the Year. Of his experience at the Legion Athletic Camp he says: "I think it is a great opportunity to meet great people and learn from coaches that you might never get exposure to. Plus you have a lot of fun doing it."